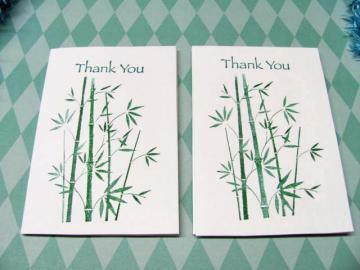 Here are the handmade bamboo thank you cards plus an envelopes. This are made up of white card stock paper, hand stamped by a bamboo design and stamped the thank you on top of the bamboo. This card is great for a quick thank you note to someone. A gift enclosure and other things you can do to make someone smile. This cards measures 3 1/2" x 5". This is available at Made By Gen. See you there.